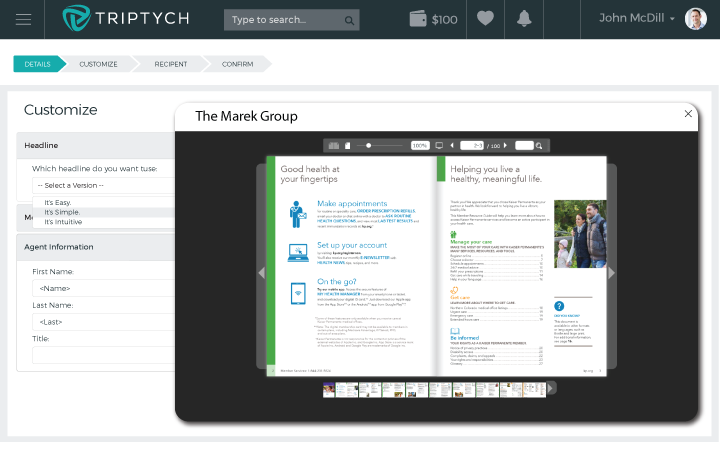 Triptych Satisfies the Strictest Compliance Officer and Supercharges Your Entire Field Marketing Team. There’s always pressure to do more with the resources you have. Your field sales reps want to be freed from the administrative ball-and-chain and your marketing managers need the ability to measure the contribution that marketing is making. Align your teams so you can stop wasting resources on inefficient processes that drain your budget. Help sales operate more effectively. Your field sales force will be able to find pre-approved customizable enrollment kit components instantly, to deliver in the media of their choice. In the middle of a pitch, there’s no time to sort out the nit-picky details of access management. Let the platform do the thinking for you: provisioning the right content and access to the right users, every time. Reps need to move quickly to make their sale, but you can’t afford a legal compliance misstep. One rep creating the content they need to make a quick sale could slip up the messaging and cost your organization up to $3 million in federal fines per instance. Keep every piece of content your field sales reps create in line with the highest degree of HIPAA and HITRUST CSF compliance, built-in automatically, and delivered effortlessly across your entire organization. Your field sales reps are frustrated that they don’t have what they need to generate leads, and your marketing team feels the pressure to keep churning out content, even though they don’t have the data to know what works. 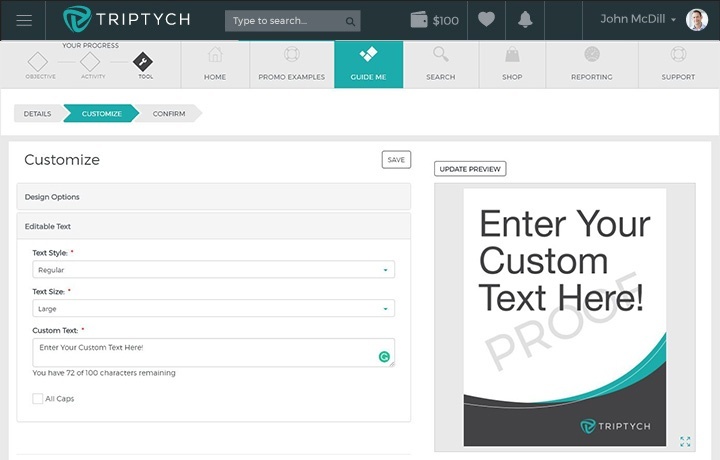 Give your reps a confidence boost with instant access to resources via the Triptych cloud platform they can easily customize to fit the way they sell, and that speak directly to the needs of your customers. Your marketing team gets actionable data so that they can easily focus efforts on creating content that sells best. Want the big picture? 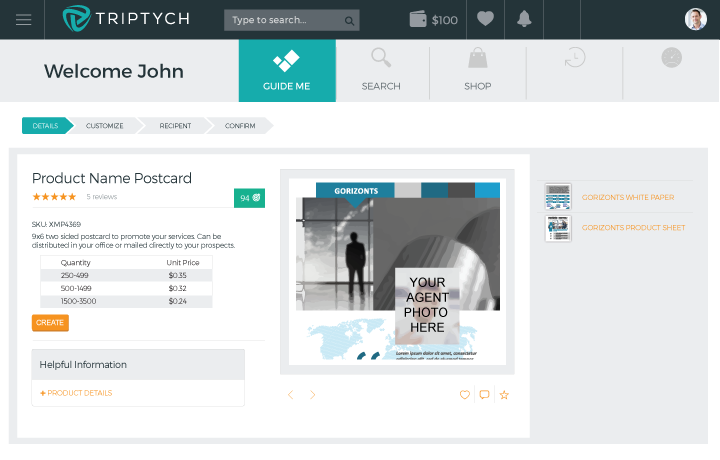 Find out how Triptych’s cloud-based platform can catapult your field sales team to new heights without straining marketing resources. If one person creates a brochure and overnights several hundred to a trade show, the cost doesn't seem that excessive. Multiply that by 500 field sales reps in a large, distributed sales force and suddenly you have a real problem. Hidden fees and inefficient processes are costing you real dollars every day. 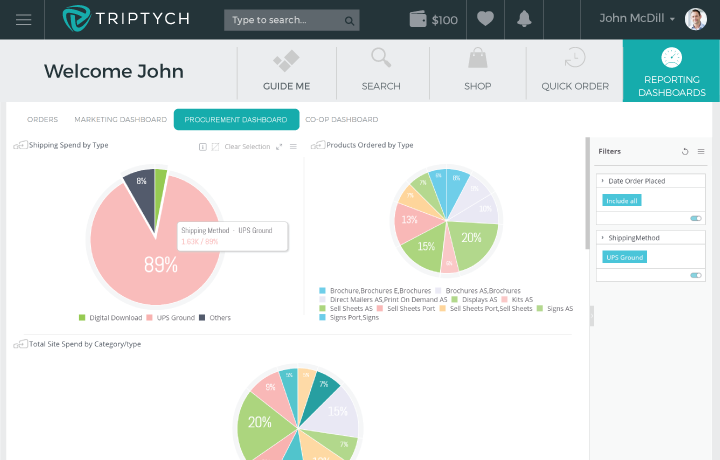 Triptych provides robust data that allows you to optimize sales and marketing operations for the greatest efficiency and ROI—think of all the non-marketing activity dollars that can go back in your budget for next year. Rogue sales reps creating their own content when they can’t find what they need can cause a spread of panic across your branding team. But the team can rest easy knowing that the integrity of your brand is protected. The field sales force has room to customize content for their audience, but only with on-demand assets that your team pre-approved and guaranteed to be on-brand, effective, and compliant.